I have already sung the praises of The Florida Project on multiple occasions, even declaring it my favourite movie of last year. So there isn’t much more I can say about the film at this point that I haven’t already said, other than the fact that it’s worth seeking out now that it is available on Blu-ray, especially if you haven’t seen it yet. Directed by Sean Baker, the film follows Moonee (Brooklynn Prince), a six year old girl who lives with her young mother (Bria Vinaite) in a rundown motel that stands in the shadow of Walt Disney World in Orlando, and is run by the stern but kind manager Bobby (Willem Dafoe, in an Oscar-nominated supporting role). For more on the film itself, you can read my full review right here. The Blu-ray comes with a selection of bonus features. 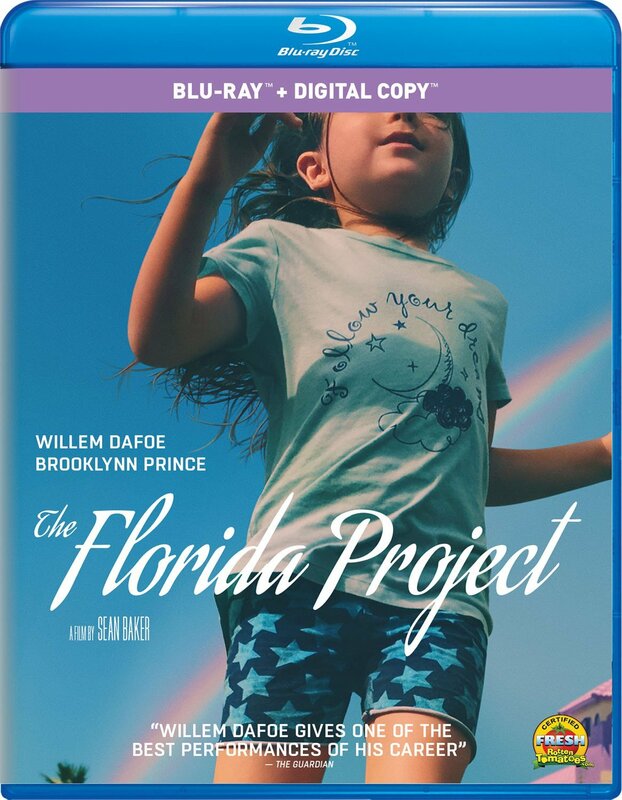 First up is Under the Rainbow: Making The Florida Project, a 22 minute featurette that is broken up into brief segments, giving us an on the ground look at the production, from rewrites in the middle of the shoot to how they left ample room for improvisation and worked closely with the kids to help them deliver such naturalistic performances. There is also a short highlight reel of bloopers and outtakes, as well as an approximately fifty minute block of interviews with the cast and crew including Brooklynn Prince, Valeria Cotto, Bria Vinaite, Mela Murder, Willem Dafoe, Sean Baker and Chris Bergoch. Sean Baker talks about how he wanted to make an authentic movie about America’s “hidden homeless” population, why he chose to go the route of using mostly first time actors, and the inspiration that he drew from The Little Rascals in crafting a film about childhood. All in all, these bonus features shed some interesting light on the passion and dedication that went into making this truly special film. The Florida Project is an Elevation Pictures release. It’s 112 minutes and rated 14A.